When you install a Configuration Manager site, several default site system roles are automatically installed for the site. These site system roles are required for the core operation of each site and although some default site system roles can be moved to other servers, they cannot be removed from the site. Which of the following is NOT a default role? Optional site system roles are site system roles that are not required for the core operation of a Configuration Manager site. However, by default, the management point and distribution point, which are optional site system roles, are installed on the site server when you install a primary or secondary site. Although these two site system roles are not required for the core operation of the site, you must have at least one management point to support clients at those locations. Via Operations Manager you can use the Operations console to search your environment for manageable objects and then deploy an agent to any object that you want to monitor. The process of searching your environment is called ___? Your company uses System Center 2012 Service Manager to manage and track problems. You need to ensure that a user named Admin1 is notified automatically when an incident is updated. What should you configure? To answer, select the appropriate category in the answer area. Before notifications are sent, first configure each notification channel, such as the settings for Simple Mail Transfer Protocol (SMTP). Notification messages are sent based on a notification template. Therefore, you will need to create a notification template. Your company has a datacenter in Los Angeles that contains a private cloud. The private cloud contains a System Center 2012 infrastructure. - Integrate runbooks to Service Manager requests. 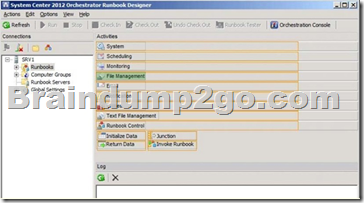 - Automate administration tasks by using runbooks. - Provide end users with the ability to perform administrative tasks. The System Center Integration Pack for System Center 2012 Configuration Manager is an add-in for System Center 2012 - Orchestrator. It enables you to automate actions within Microsoft System Center 2012 Configuration Manager, such as software and update deployment. In addition, it allows you create and modify collections. With this integration pack, you can also create workflows that interact with and transfer information to the integration packs for System Center Service Manager, System Center Data Protection Manager, System Center Operations Manager, and System Center Virtual Machine Manager. 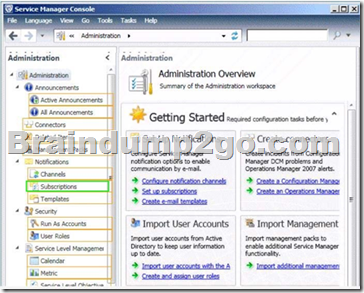 Configuring the System Center 2012 Service Manager Connections A connection establishes a reusable link between Orchestrator and a Service Manager Server. You can create as many connections as you need to specify links to multiple servers. You can also create multiple connections to the same server to allow for differences in security permissions for different user accounts. Your company has a private cloud that is managed by us.ng a System Center 2012 Operations Manager infrastructure. The Default management pack that ships with OpsMgr 2007 is used to store very specific information for the management group. It is a widely known best practice to NOT write any custom rules, monitors, groups, views, or overrides to this MP. Even customers who know this - and try to enforce this across their organizations.... will still inadvertently get junk in their default MP.... they will save things here by accident, or by granting access to advanced operators who aren't educated on this topic. The main problem with doing so.... is that we will build a dependency for this MP on any MP it references....and therefore we wont ever be able to delete those management packs, until we clean this Default MP up, and start enforcing best practices.